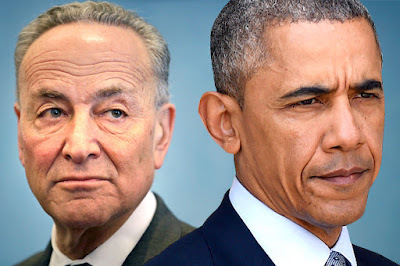 JooTube.TV: Will Chuck Schumer deliver a dozen Democrats to override Obama's Iran veto? 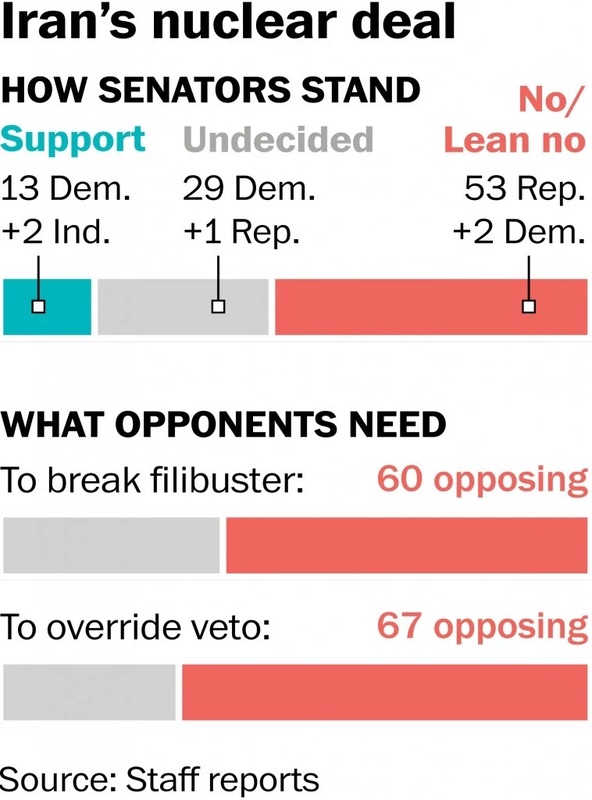 Will Chuck Schumer deliver a dozen Democrats to override Obama's Iran veto? Senator Chuck Schumer says leaders need to go back to the table to renegotiate the Iran Deal, and made his first public comments about the statement Monday afternoon in Greece. Schumer says the deal has too many flaws: He says a 24-day delay for inspections doesn't offer complete security against nuclear development in Iran, and he's concerned about categorizing the country as a nuclear threshold state in ten years. "If you believe the Iranian regime may change, then you say, 'Ok, it's a gamble.' But if you think they're going to be the same horrible regime they are now, you don't want the United States and the other nations of the world putting a stamp of approval on Iran being a nuclear threshold state." The deal currently promises Iran relief from sanctions that have devastated the economy, as long as it curbs its nuclear program and submits to inspections for a decade. The senator says he thinks the regime might use that money to cause political problems in the Middle East instead. Schumer says he does not believe this position will threaten his leadership role within the Democratic Party. The senator says renegotiating would be difficult, but he believes sanctions are strong enough to keep Iran invested in brokering a deal. More than 20 speakers presented arguments to over 10,000 New Yorkers to appeal to Sen. Chuck Schumer and other members of Congress to oppose this initiative at Stop Iran Rally in Times Square July 22, 2015. Jeffrey Wiesenfeld of the Jewish Rapid-Response Coalition emcee'd and opined that it wouldn't be sufficient for Schumer to give a nice speech, then say that others should "vote their conscience." Citizens should demand Schumer, as a likely party leader, should round-up enough votes to over-ride Pres. Obama's veto. At the press conference in Greece, NY, Sen. Schumer explained his decision to oppose Obama's Iran proposition. He feels the solution is to try secondary sanctions on Iran. He states- but doesn't emphatically enough argue his points to persuade other Democrats, just as Jeff Wiesenfeld fears. Said Schumer, "A lot of this is a question of judgement. It's a close question . . . I don't begrudge anyone who sees it the other way." While virtually every Democratic senator said initially that he or she was undecided on the Iran deal and planned to make a decision only after close study, only a small subset of the Democratic caucus is considered even close to likely to vote against it. 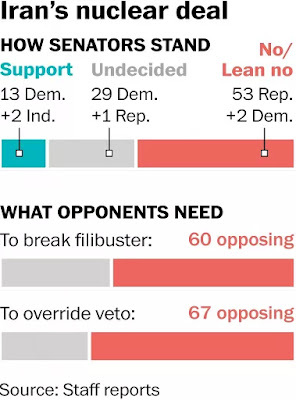 Long story short: getting the 67 votes to override a veto would require a monumental feat of persuasion under the current circumstances, and getting the 60 necessary to block a filibuster is hardly assured. To make his mark, Mr. Schumer would have to do more than vote no. He would have to do what Jackson did in his day: To lead, to rally others to his side, and set before the American public an alternative approach for dealing with a determined and untrustworthy enemy. Sure, the president and his supporters would howl. They are howling now, and it’s not pretty. And sure, it was easier for Scoop Jackson to go up against a president of the other party rather than one from his own. But those who have doubts might ask Jimmy Carter whether Jackson was afraid to buck his own president if he thought it necessary. Among the upsides for Mr. Schumer is that he’d be liberated from having to defend policies that he knows leave the world less safe and make war more likely. He would help address the drift of a Democratic Party that booed the mention of Jerusalem at its last convention. Finally, he would be greeted as a hero by a good swath of the American electorate—and rightly so. Manifestly, the odds are stacked against Mr. Schumer’s recruiting enough Democratic senators to get to the 67 votes needed to sink the nuclear deal. But it’s no sure thing for the White House, either. Most Americans are skeptical of the agreement; the president’s defenses are proving petulant and unpersuasive; and five weeks remain before a vote. ... The dual-loyalty smear popped up even before Schumer came out against the deal. A New York Times editorial, for one, talked of the “unseemly spectacle of lawmakers siding with a foreign leader” — Israel’s Benjamin Netanyahu — against Obama. In fact, it’s Obama who’s siding with foreign leaders: Iran’s. At least Israel’s an ally. Schumer still seems to think he can appease the deal’s supporters by not pushing aggressively for its defeat. It won’t work. Schumer made a potent case against the deal last week — warning, above all else, that it hands at least $50 billion to an Iranian regime that’s likely to become even more hard-line. He also rightly sees this as paving the way for Iran to get nukes via a US-approved process. How is that not a life-or-death matter? Sorry, senator: There’s no excuse for not doing everything — everything — possible to stop this madness. And, as the anti-Semitic attacks and other threats suggest, pulling your punches won’t buy you any love from the pro-deal zealots. Schumer’s long dreamed of becoming Senate leader. Now’s his chance to show leadership, stand up for what he says are his beliefs, convince fellow senators to nix the deal — and head off a nuclear Iran. Schumer is against the deal because it is harmful to the United States, not just to Israel. It is his American conscience that wouldn't let him support the deal. Schumer will vote to defeat Obama’s Iran Nuke Deal. So doing he risks the displeasure of the President and the Party. He also risks losing his bid to become Party leader in the Senate. Last week, Obama spent an hour trying to put lipstick on this pig. The President resorted to a crafty age-old trick, blaming Israel – you know, the Jews, wink, wink – in case the deal fell, and he singled out Prime Minister Benjamin Netanyahu for being so stubborn. Obama was sending a message. The message was meant for Bibi and the warning was meant for Schumer. Behave or else. Hours later, Schumer went public. He refused to be intimidated. The timing itself – that really took guts. Schumer became an instant hero to those who disdain the Iraq deal, and rightly so, but some people wanted more. Why did Chuck say that he was only acting on his own behalf? Why did he say that he would not, repeat not rally his fellow Democrats to his side? Well, what more can we possibly want? Schumer still has to live in the real world. He still has to caucus with members of his own Party. He still has to do lunch with the President – the leader of his Party, the leader of his country. Too much lobbying would be rubbing it in. Schumer has done plenty as it is. He should not be made to answer for what he is not doing. We know where the Liberals stand. Running on TV at the moment is a J Street commercial frantically supporting the deal. Swallow it, they say. It’s good for you. Take the medicine. Why is it so good? Because Obama says so, that’s why. Plus, John Kerry and his team put it together and is there a smarter man on the face of the earth than John Kerry? To this observer, there is no need to talk centrifuges or “snap-back” clauses or secret agreements to know that Kerry was taken to the cleaners. The proof of it is that Kerry left Tehran leaving four hostages behind. If he could not get that much business done, surely he was swindled on everything else. But the Left insists that we won. They tell the rest of us that we have no right to object because we do not have all the facts. This is true. We do not know all the details. Precisely why we are suspicious and why we find it impossible to talk to a Liberal. They truly say this… They argue that nobody knows what’s in the deal… but it’s a good deal. Stop scratching your head. Go, make sense of that logic…plus this logic from Obama himself, saying that they “don’t really mean it” when they chant “Death to the United States” and “Death to Israel.” Six million Jews had to die in order to prove that Hitler really did mean it. How many chances are we supposed to give the ayatollahs to likewise prove that they mean what they keep saying?